This is Lactobacillus bulgaricus probiotic supplement. It provides a minimum of 2 billion colony forming units (cfu) of LB-51 transient super strain in each serving. It provides support throughout the digestion process. Digesta-Lac® travels along with the food as it’s being processed, to naturally aid digestion while deterring harmful bacteria. It may discourage the use of intestinal stimulants and antacids. It is helpful to those who are lactose intolerant. It stimulates regularity and helps the body digest complex carbohydrates and proteins. Naturally aid digestion while deterring harmful bacteria. Helps to complete the digestion process and may discourage the use of intestinal stimulants and antacids. 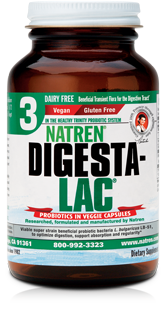 Digesta-Lac® is available in powder form. Helps maintain our natural electrolyte balance, particularly as we age and become less active. Nutritionally helps to deter yeast overgrowth (candida). 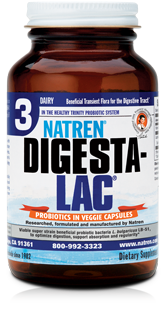 Compare our prices for Digesta-Lac® with Natren's prices on Natren's website.